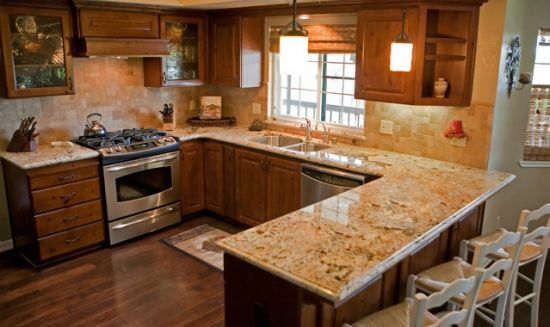 Are you thinking of remodeling your kitchen? 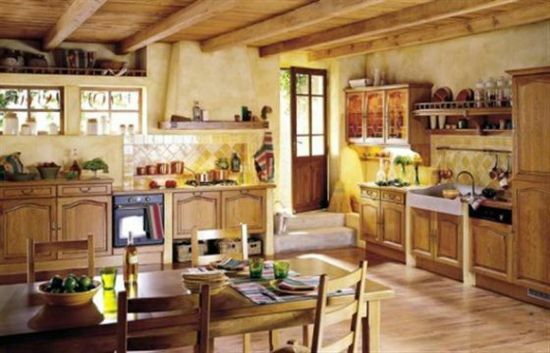 Have you moved house and thinking of designing a Tuscan Kitchen? 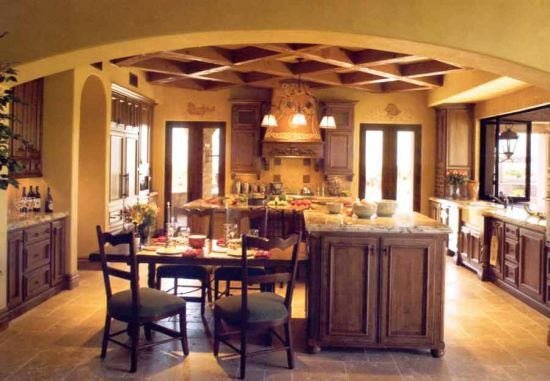 When you think of Tuscan designs it evokes an image of warmth and comfort. There’s nothing more beautiful than a lovely Tuscan kitchen where the whole family can gather to talk about the day’s events and have food as well. For a woman who loves to cook and entertain too, a Tuscan kitchen is a great way of showing off her culinary skills to those whom she invites into the warmth of her home! The colors of choice when you think of Tuscan kitchen ideas usually revolve around terra cotta, burnt orange, sunny yellows and lovely blue of the Mediterranean seas. The choices are unlimited and there is something so traditional about such designs that you feel transported back in an era when the world moved at a leisurely place and the kitchen would ring with laughter of the young and their delight at the culinary meals prepared by the loving hands of their mother. 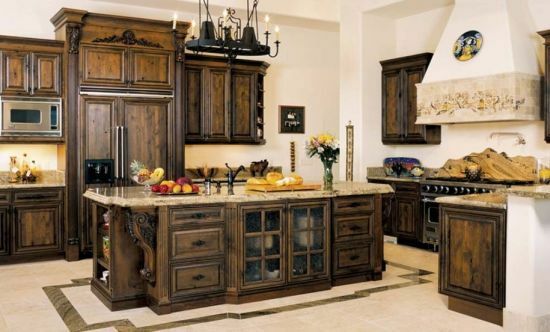 Following are 18 amazing Tuscan kitchen ideas which are breathtakingly beautiful as well as cozy. This lovely Tuscan kitchen with its grandiose wooden cabinets and lovely stoned tiles is an epitome of timeless elegance and classiness. The spaciousness of the kitchen makes it possible to have a dining table to which is craftily attached a sink to save space as well. The stoned tiles harmonize the grandeur of the wooden cabinets with their earthiness and make this a wonderful Tuscan kitchen idea. 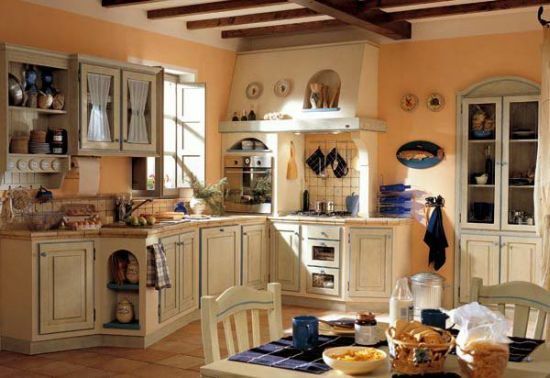 This exquisite and charming Tuscan kitchen design looks wonderful and is delightful to look at. Imagine cooking for your family in a kitchen as beautiful as this one. The large curtain less window lets in a stream of light which would make it look really inviting on a hot sunny day or equally romantic in the low light of dusk. So whether you are a large family unit or just two looking to start a new life, this superb kitchen would add great charm to your home. This quaint and picturesque Tuscan style kitchen evokes thoughts of old fashioned simplicity which is very appealing to the eye. For those who are simple at heart and prefer all things straight forward yet comfy this is an ideal kitchen choice. This unusual white color Tuscan style kitchen with its white cabinets and lovely white dining table and chairs epitomizes a peculiar kind of beauty which looks remarkably lovely. The open windows allow a flood of sunlight into the kitchen which is so very typical of customary Tuscan designs. This remarkable and lovely Tuscan style kitchen with its marble counter tops and dark wooden floors is a combination of comfort and luxury combined into one. The textured wooden floor gives it a grand look yet it is balanced by the earthy marble thus making this kitchen look extremely welcoming and delightful. The tiled backsplash which is typical of Tuscan designs lends this comfy kitchen a sense of warmth and a bit of old age glamor. The marbled butcher block is a dream come true for a culinary expert and the granite countertops add a bit of modernity to this otherwise traditional design. An ideal Tuscan kitchen idea for those who are fans of the old yet are not afraid to bring in the new either! This classic Tuscan design lends a grand ambiance to this lovely kitchen which not only makes it look inviting but also quite stylish. 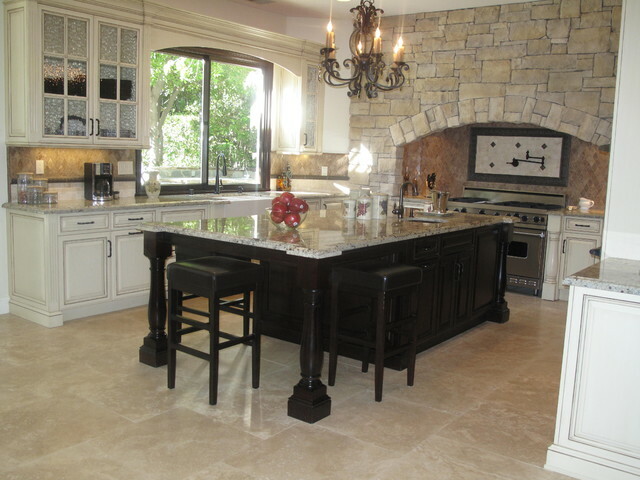 The beautiful backsplash of travertine tiles adds a distinct touch of a warm Tuscan atmosphere. 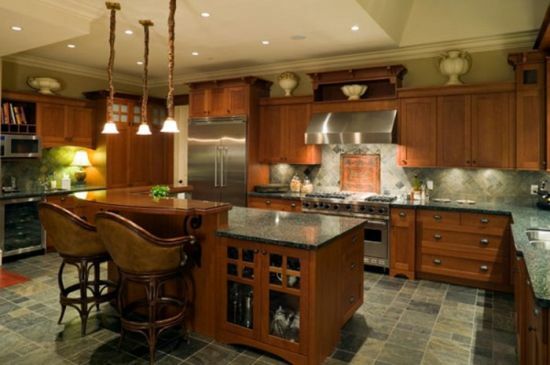 The dark brown counter top featured in the center island and the overhead chandelier add to its subtle charm. 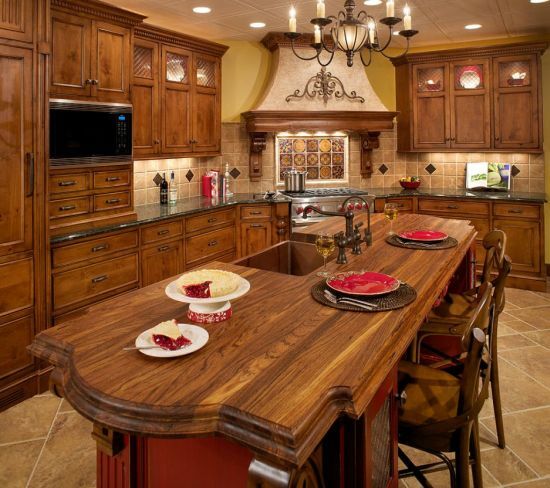 This classic and large Tuscan kitchen is ideal for big family dinners and gatherings. The tumbled marble flooring adds a rustic touch. 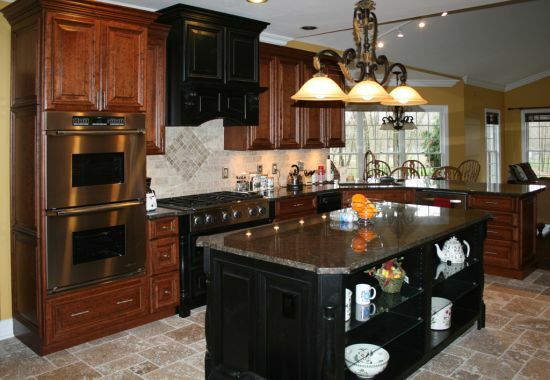 This kitchen is characterized by a large cooking range and is complimented by an assortment of cabinets which add to its overall spacious look. If you are interested in the truly rustic Tuscan styled kitchen then this Tuscan kitchen design would surely catch your eye. For those who believe in an authentic touch while designing their homes, this traditional kitchen with the lovely textured wall is a great idea. Since Tuscany is known for its warmth and sun, the large glass door and windows with wood panels add a touch of distinct Tuscan element to this lovely and spacious kitchen. The textured floor is also an authentic touch which is complimented by the delightful hanging lights. 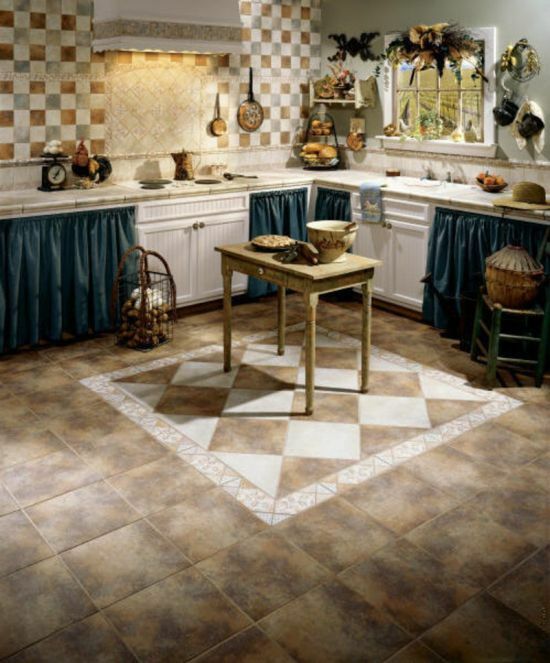 The old fashioned mosaic floor with geometric patterns and the backsplash of tiles in the background add a touch of traditional charm to this typical Tuscan country kitchen. The marble countertops and the compact white cabinets also add to its overall appeal. 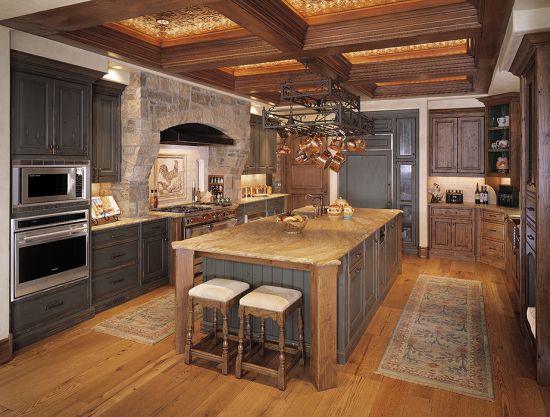 This dramatically stunning Tuscan kitchen idea is surely enticing for those who like all things grand and exciting. The majestic looking table at the center island lends this kitchen an ostentatious look which is tempered by the rustic looking tiled floor. If you have a very limited space in your home yet are keen to implement Tuscan kitchen ideas you would be delighted with this beautifully styled yet simple Tuscan kitchen. It occupies limited space yet also has elements of Tuscan style as its saving grace! 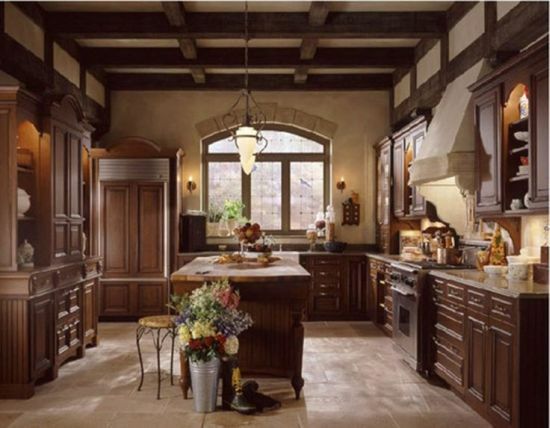 This lovely and serene Tuscan kitchen idea is a combination of the old world classiness and a bit of new world glamor. This is a winning combination for those who would like to implement the charm of both old age Tuscan designs yet balance it with a bit of modernity. 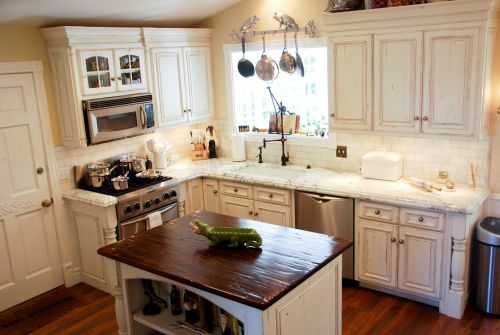 This strikingly rustic Tuscan kitchen idea may catch the fancy of just about anyone. There’s something so stunning about the way everything appears so old and pastoral. It evokes an image of rural Tuscany with its well worn and comfy look. The beautiful white worn cabinets, the big window which allows plenty of sunlight and the small but tasteful dark center island give a quaint and charming appeal to this Tuscan kitchen. 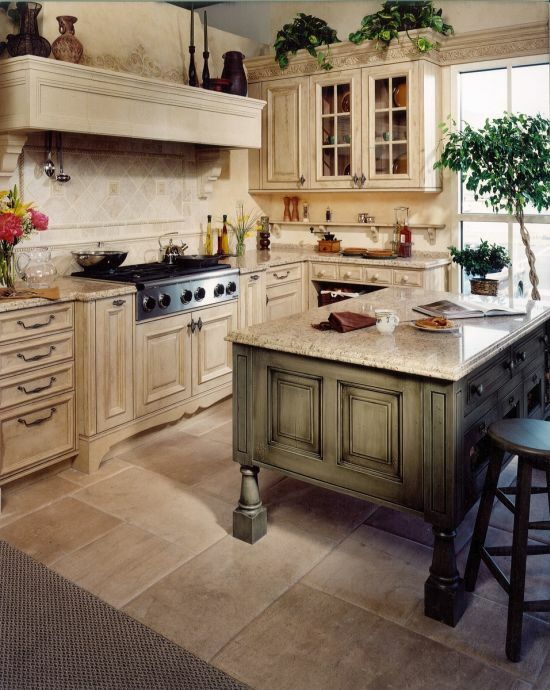 Made for homes with smaller kitchens this Tuscan design will definitely add a rural allure to your homes. The pastoral looking stone wall of this Tuscan kitchen evokes the images of an Italian countryside and has a certain rustic appeal. 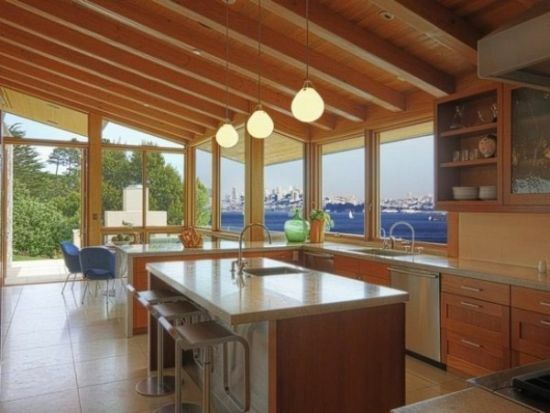 The lovely wooden furniture and large glass windows all add up to its idyllic beauty. If you are a large family unit than this grand and comfy Tuscan kitchen would be idyllic for your homes. The large marble countertop along with the tiled backsplash has a certain contented and relaxed look about it. 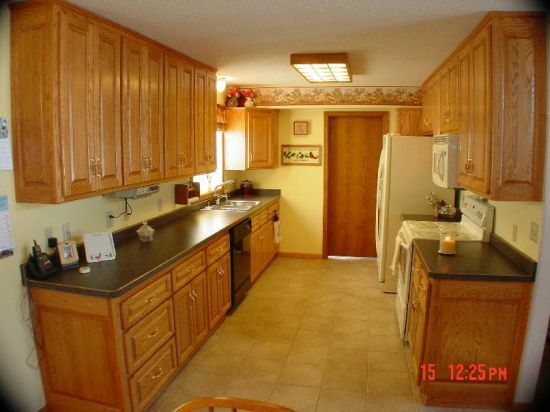 It’s the sort of kitchen which gives you a sense of warmth and security. You can spend many happy hours here chatting with your children and cooking huge pots of sumptuous pasta! Tuscan kitchens are known for their rural beauty and bucolic charm. 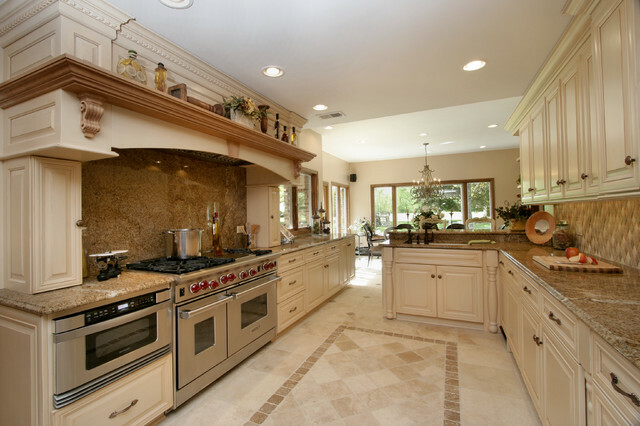 These kinds of kitchen allow you to indulge in your love for cooking. Many happy hours can be spent in such kitchens because they appear to be so welcoming and convivial. 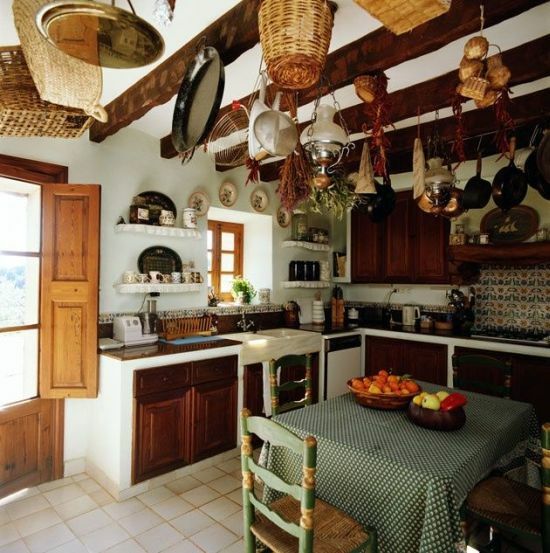 So go on and indulge yourself in designing a perfectly rural yet utterly charming Tuscan kitchen!